iRocker paddle boards are among the best iSUP boards on the market, and are created from the best available materials and designed specifically to withstand the inevitable harsh terrain you may encounter along your journey. The shape of the boards from nose to tail was specifically designed to enable a rider to handle most water conditions without sacrificing any performance and speed. 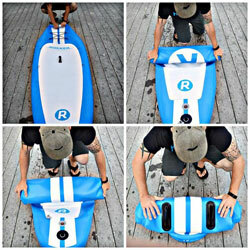 iRocker inflatable SUP boards are fast, durable, stable and built to handle more than just a single rider. 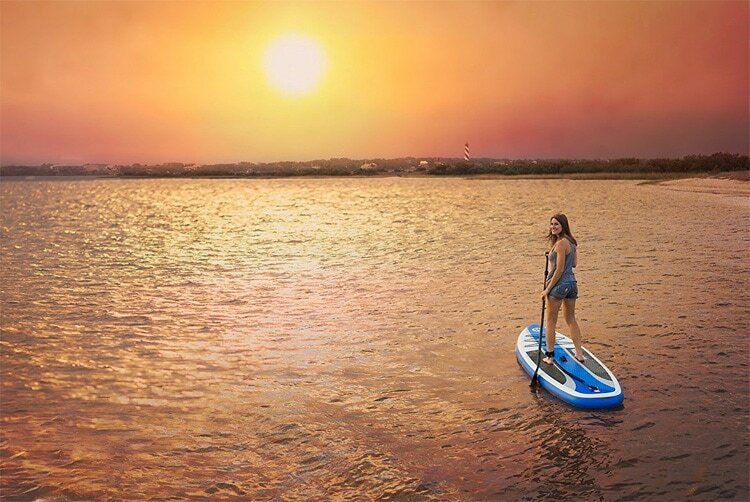 For the paddleboarder who is searching for a line of inflatable stand up paddle boards designed for a sleek toughness and quick and easy access to the water whenever you feel the water calling your name, the iRocker is everything you’ve ever wanted and more in an iSup. 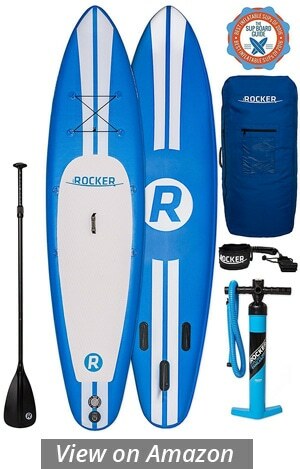 If you are looking to purchase an inflatable stand up paddle board, consider the iRocker Inflatable Paddleboard Company as a top pick on your research list of iSup brands. Reliability, versatility, and style is what riders can look forward to in their next purchase. This list of iRocker models gives it all to the traveler, weekend shoreliner, or aquatic fitness nut. The iRocker All-around 10’ x 32” x 6” is the ultimate beginner/intermediate iSup that offers great rigidity and buoyancy to riders that weigh up to 350 Ibs. With a full inflation capacity of 15psi, the military grade PVC, triple layer drop stitch material used for its core construction and the thick and rubber canvas material holds its own when it comes to deflecting the external elements beneath and on top of the water’s surface. If you like a chill and sleek style in your board design, you’ll love the double white pin stripe down the center of the royal blue base color of the iRocker All-Around SUP. The diamond cut extended deck pad is black, blue and white strip pattern with the iRocker print logo alongside the left rail it covers the perfect amount of surface space for practicing yoga, or walking the board when riding small to medium size waves. An R iRocker logo is also located on the nose and side rail of the board. A criss-cross bungee strap is also located in the upper center of the board which will easily secure your personal belongings or small cooler in the 3.3 sq-ft of storage it provides. Included on both rails are four extra D-rings for easy strapping accessories or various supplies and the center handle piece makes for an easy carry to and from the car. For the paddle boarder looking for a little more length and walking surface in their iSup, the iRocker 11’ x 32” x 6” All-Around shape is another great inflatable for all skill levels. The long length and pin tail shape adds for a more slender and speedy ride, and whether you want to hit the waves, cruise the shoreline, or hang out in the shallows with your friends or pets, this board offers great stability and is capable of floating up to 385 Ibs. The ideal board for tandem paddling and long distance excursions, its ultra durable construction inflates at a maximum of 15psi and weighs 24 Ibs, which is considerably lightweight compared to most inflatable paddleboard models. The simple white and gray color tone with a solid black rail perimeter is nothing fancy, but offers visibility and a bold expression on the water. The squash-tail provides sufficient stability and the three-fin system keeps the iRocker All-Around on a straight and narrow path when cruising or riding small to medium size wave lines. 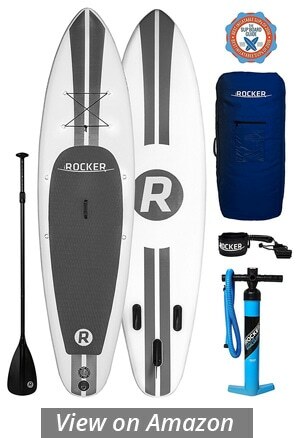 The 10’6 x 33” x 6” iRocker Cruiser paddle board is an excellent choice for the rider who wants to get a little more performance out of their iSup. Easily maneuverable with its shortboard surfboard style design, this board is great for long distance adventures and surfing. Constructed for maximum durability and endurance, the military grade PVC drop-stitch material allows this model to inflate to a maximum of 15 psi and holds a strong, reliable stance when on the move. The 33-inch width and 6-inch rail thickness offers plenty of stability and the tri-fin system add to rider stability and control. This board is appealing with colder colors of royal blue, black, gray and white. The bold blue stripe down the center has the R logo and iRocker thick print down the center of the board and the deck pad adds to the slender look of this iSup with a black sides and a blue and gray center. The extra D-rings on each rail add for extra storage space for bags or a strap down cooler seat, and the cross pattern bungee on the upper center offers the same with 3.3 sq-ft of storage. The iRocker Cruiser is great for all skill levels. If you’re looking to have a great personal board for a series of versatile aquatic environments, the Cruiser model is the way to go. Looking for sleek maneuverability and a durable stance throughout your iSup ride? The 10’ x 30” x 6” iRocker Sport offers a narrow and speedy cruise through the water and when it comes to river rapids or waves, all skill levels will have a sufficient stance and a new sense of style in their ride. The triple layer Military grade drop-stitch PVC material adds a durable rigidity to this board and can withstand weights up to 350 Ibs. The white base color supports a double gray pin-stripe down the center of the board with a coffin-shaped, diamond cut, grey colored deck grip. The iRocker printed logo is across the upper center of the deck pad and the R logo is at the tail end. A simple cross pattern bungee configuration is located at the upper center of the board for securing your bags or coolers, and four extra D-rings are included on the rails for strapping cooler seats or other accessories. 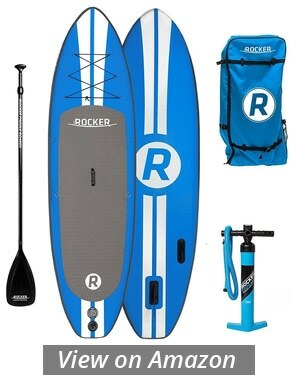 The bottom surface has a matching pin-stripe bottom graphic with the iRocker R logo in the center of the board, and also located on the bottom surface is the triple-fin system that adds to the stability and control of this sporty design. The next step up from the iRocker 10’ Sport model, is the Sport 11’. For the rider who wants to carry more supplies on extended paddling trips and wants the same reliability and performance as the shorter model, this board is the way to go. The 11’ x 30” x 6” narrow design makes for a smooth and rapid ride when cruising the river or following the tides. Though still wide enough for practicing yoga, it is a few inches shorter in base width for some. With its length and cross pattern bungee system in the upper center and the four extra D-Rings on the rails for strapping accessories or a cooler seat, all experience levels can enjoy the versatility of the iRocker 11’ Sport model. With its Military grade PVC drop-stitch construction, riders up to 385 Ibs will have no issue with covering long distances or floating comfortably across the surface. The pin tail shape of the iSup also allows for easy maneuverability when cruising the rapids or lining up with the face of a wave. This board is built to last and can withstand the sun and water elements with its reputable longevity. The white base color sports a double gray pin-stripe with a gray-colored diamond cut deck pad. The triple fin system adds directional support and stability and this package includes a everything you need to enter the water. Constructed from triple layer military grade drop stitch material, iRocker paddle boards are built to withstand impacts from dings, rocks, concrete and wool pilings. Run them into the rocks or accidently drive over them with your car, iRocker SUP boards are virtually indestructible. 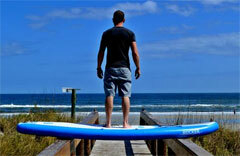 Because of their clever technology iRocker paddle boards are also very rigid. A must in any conditions, but especially when using these boards while surfing on low waves. This is confirmed by customers. Even though when fully inflated they are about as rigid as solid SUP boards, iRocker paddle boards are inflatable. 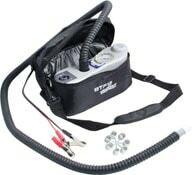 With the accompanying high-pressure pump it takes about 150-180 pumps to get them fully inflated at 15 psi. Customers report that this takes about 5-10 minutes. After deflating, which should take you about 2-3 minutes, they roll up easily and can be transported in the included back pack carry bag. And where storing a large solid paddle board is often a pain, storing a rolled-up iRocker paddle board is no issue at all, any shelfspace will do. 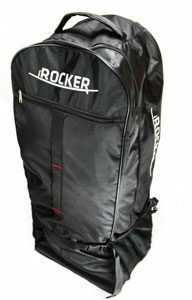 The iRocker carry bag backpack has adjustable shoulder straps, for more comfortable wear. Customers are impressed by the build quality of the backpack and say that transporting their iRocker SUP board in the backpack works very well, and write that the backpack is even strong enough to withstand rougher treatment by airport baggage handlers. iRocker boards come with the fittings pre-installed to accommodate attachment of your iRocker Kayak seat. Turn your iRocker paddle board into a full-blown kayak with the optional kayak seat and kayak paddle blade. This Kayak Paddle Blade fits on the included iRocker paddle, and gives you a dual blade adjustable kayak paddle. The Bravo BTP12 is a super efficient lightweight single stage stage high pressure piston pump that will inflate from 1 to 15 PSI in approximately 4-6 minutes and completely deflate your board in 2-3 minutes. Simply set the turn dial to your desired pressure setting, press the “on” button and this little workhorse will do the rest. Included: 102″ (8’6″) cable with alligator clips 72″ (6′) inflation hose specially adapted to inflate your inflatable iRocker paddle board. Ready for your next trip to a tropical place? 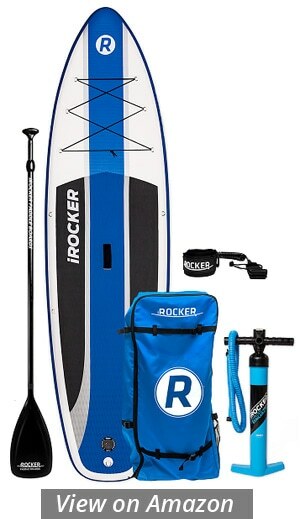 On your next vacation check your iRocker Inflatable Paddle Board and accessories in this durable luggage bag. Load your board, paddle, and pump in this bag and you’ll be under the 50lb weight limit set by most airlines. 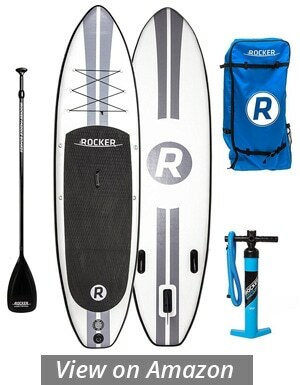 The iRocker manufacturer brings quality style and reliability to the rivers, lakes, and beaches when it comes to inflatable paddle board shapes and designs. Perfect for the traveling water warrior or the weekender who loves to get away from the office and have a compact and easily ready board on hand. The iRocker iSup company is an excellent choice for all skill levels and those seeking a variety of shapes and sizes to choose from. Each package provides everything you need to enjoy a full day’s experience on the water so you’re ready to dive in immediately upon your packages arrival. iRocker is known for their affordability and the reliability of quality design and warranty that guarantees rider satisfaction, and longevity. Find yours today and experience the joys of the water yourself.